We work as a team and are always on the lookout for people to be part of a fast moving, fun, successful organisation. We have high standards as our customers expect the best, and we recognise and reward high performance through incentive and recognition plans. To help you achieve your best, we provide comprehensive training and development programmes that can lead to exciting career opportunities and progression. Flexibility is one of the reasons that Vue is so successful. Our cinemas and their opening hours mean that we offer a variety of part time or full time contracts within both temporary and permanent positions. Should you want a short term role, or decide that you wish to establish a longer term career in one of our cinemas, there are various flexible ways of working. If you are a student looking for a job whilst at University, Vue can offer you a great opportunity. 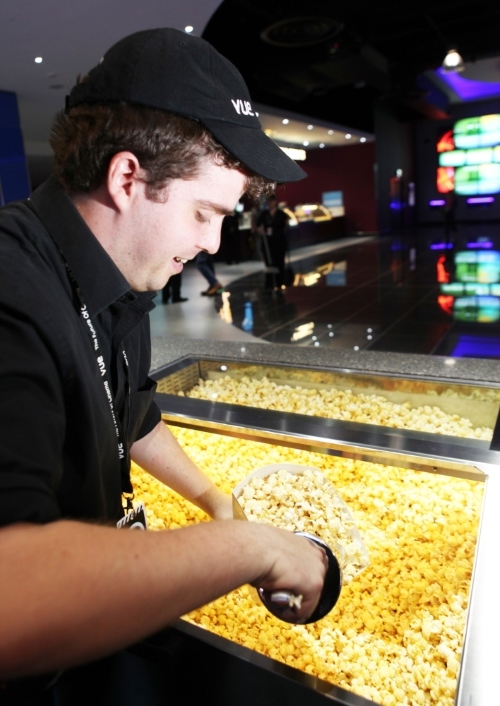 Our network of cinemas across the country means that a large number of Customer Assistants and Team Leaders start working with us when at University. In the holidays, they then transfer to a Vue cinema close to home, which is great for our company, customers and teams. Our Head Office is based in Chiswick, West London and all of Vue’s central support functions are based there. These teams work closely with the cinema teams to ensure that innovation, growth and success continues across the company. © Vue, 2014. All rights reserved.